Lot 557. Anonymous. 211-210 B.C. AR quinarius (15 mm, 2.20 g, 3 h). Rome. 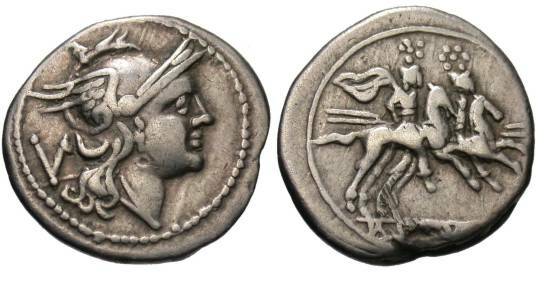 Head of Roma right, wearing winged Phrygian helmet; behind, denomination (V) / ROMA in exergue, the Dioscuri on horseback rearing right, each holding couched lance. Crawford 44/6; King 1; Sydenham 141; RSC 3. Lightly toned. Very fine.